In this lesson, we will learn how to calculate the efficiency of electrical devices given their useful energy output and total energy output. A 60 W incandescent light bulb is left on for 30 seconds. In that time, it is supplied with 1 8 0 0 J of energy but it only converts 36 J of energy to light. 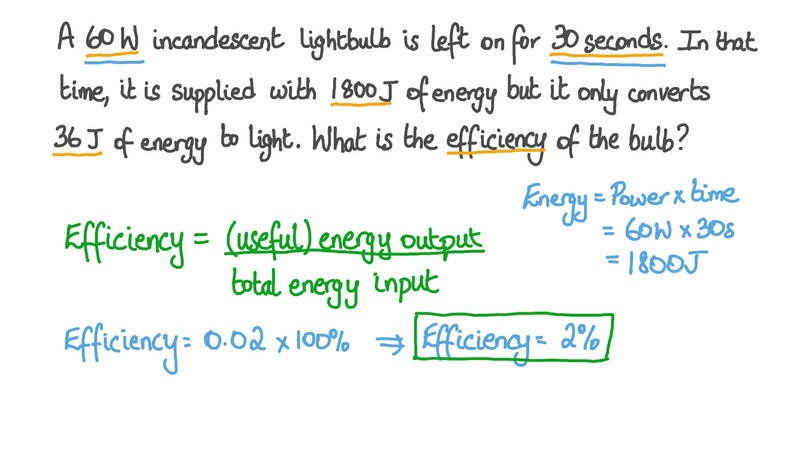 What is the efficiency of the bulb? An LED light has an efficiency of 29%. If it converts 5 800 J to light, what is the total energy it was supplied with? A 1.8 kW kettle has an efficiency of 0.92. It is used to boil 1.3 kg of water, which requires 440 kJ of energy. How many minutes does it take the kettle to boil the water? Give your answer to the nearest minute. An LCD TV has an efficiency of 0.28. Energy is supplied to it at a rate of 110 W. If the TV is left on for 90 minutes, how much energy is wasted? Give your answer to 2 significant figures. A machine has a useful power output of 400 W and a total power input of 1 6 0 0 W. In a given time, the total energy supplied to the machine is 108 kJ. What is the useful output energy transfer of the machine at this time? A 100 W incandescent light bulb has an efficiency of 5 . 6 % . 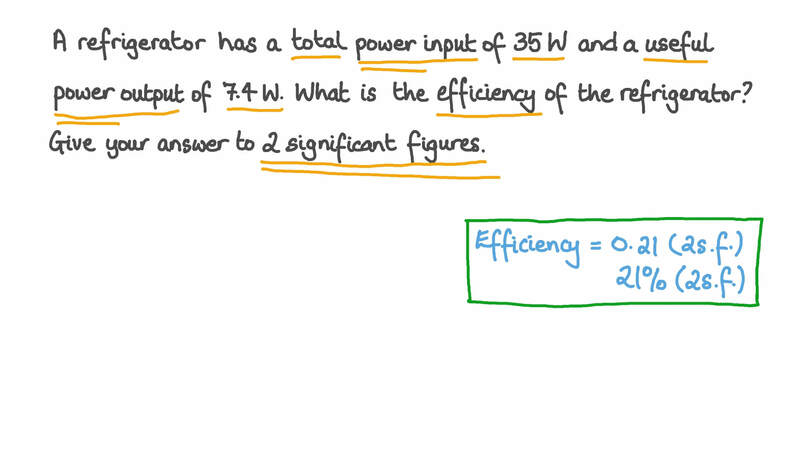 What is the useful power output of the light bulb? A refrigerator has a total power input of 35 W and a useful power output of 7.4 W. What is the efficiency of the refrigerator? Give your answer to 2 significant figures. A 120 W television has a useful power output of 30 W. What is the efficiency of the television? A laptop has an energy efficiency of 0.18. The laptop is used for 1 hour and during this time 88.6 kJ of energy is wasted in the form of heat and sound. How much energy was the laptop supplied with over this time? Give your answer to 3 significant figures. A 30 W fan is turned on for 5 minutes. Over this time, the fan is supplied with 9 0 0 0 J of energy, and it converts 3 0 % of it into kinetic energy of the air around it. The rest of the energy is wasted as heat and sound. How much energy is wasted by the fan? A fluorescent lamp converts much more of the energy it is supplied with to light than an incandescent bulb does. The efficiency of a fluorescent lamp is 22%. If the fluorescent lamp is supplied with 18 000 J of energy, how much of this is converted to light? A food blender is used for 1 minute. Over this time, some of the energy supplied to the blender is transferred to the blades as kinetic energy, but 4 kJ of energy is wasted as sound and heat. If the total energy supplied to the blender is 38 kJ, what is the efficiency of the blender? Give your answer to 2 significant figures. A kettle uses 373 kJ to boil 1.1 kg of water in 3 minutes. Over this time, it was supplied with 410 kJ of energy. What is the efficiency of the kettle? Give your answer to 2 significant figures.